Frank Suter one of Slough's leading businessmen for many years died on Monday aged 89 after a week in hospital suffering from ling cancer. 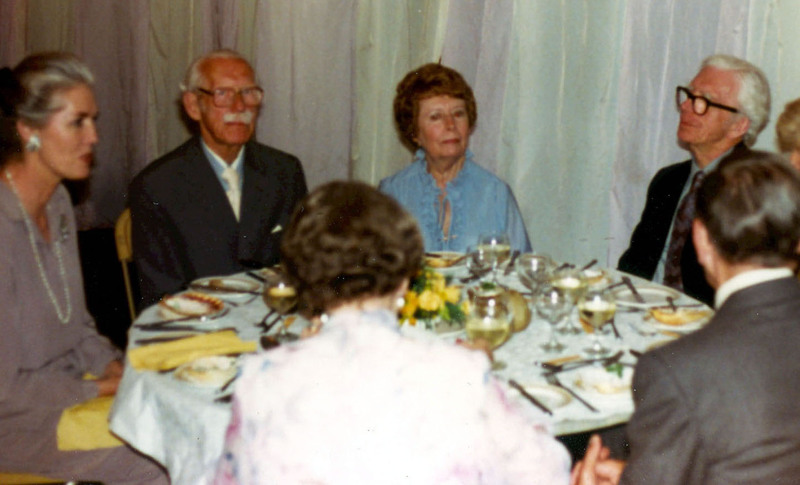 A slough resident for many years, Mr Suter was one of the the directors of the Suters department store, which was in the High Street for nearly 60 years. Born in Herefordshire, he spent his formative years in Goldrs Green and Croydon before staring an apprenticeship as an engineer in the Humbver car factory, Coventry. 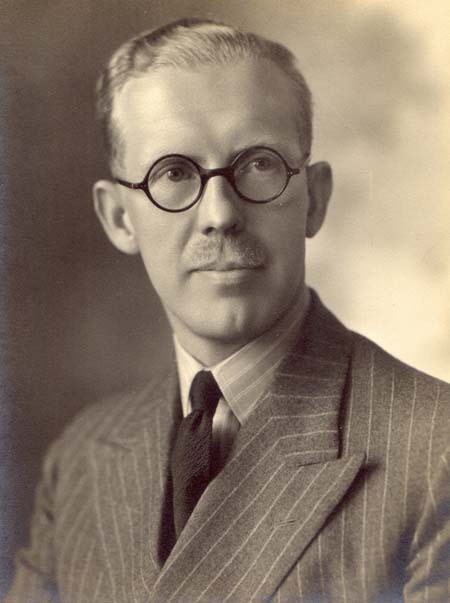 In 1920, his father George William and elder brother Clarence bought their first store in Slough. When Frank joined the company in 1924, he was a manager in the family's sister Uxbridge branch. He met his wife Vera in 1928, whom he met through her twin sister Cecily. She died in 1969. 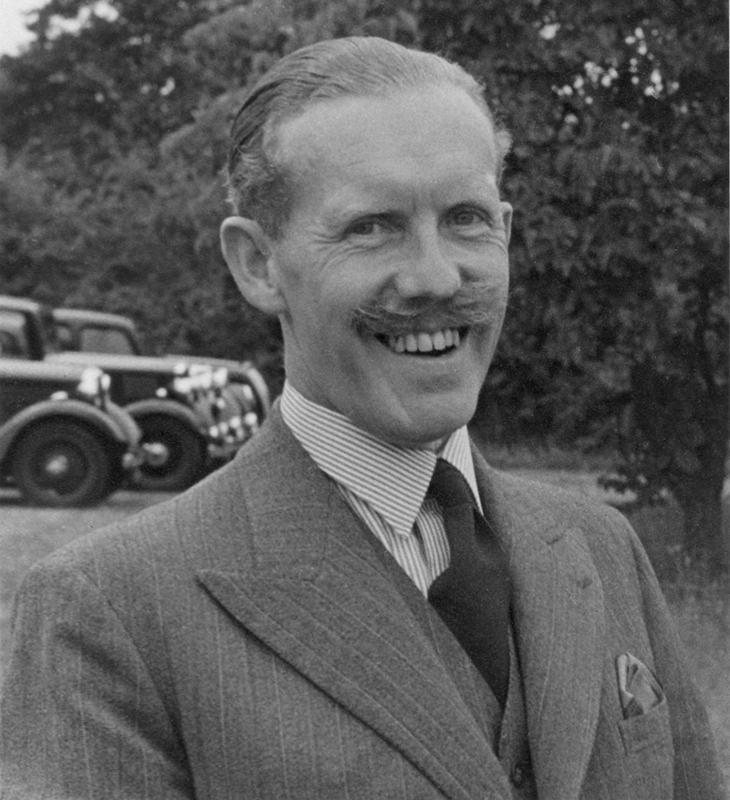 In 1941, he was called up and served in the Tank Corps, After the war he was general manager at Uxbridge and became Chairman of the group when his brother Clarence resigned in the 1960s. Since the business was sold to Owen Owen in 1978, Frank has enjoyed an active retirement . He lived at Stoke park, Stoke Poges. He was a keen gardener, bridge player and played golf only two weeks before he died. 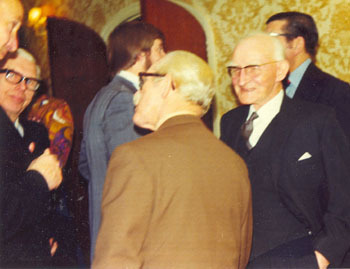 Mr Suter leaves a younger brother John, 83 and sons Anthony (Tony) 60, Ian 54 and Michael 52. He also leaves grandchildren, Hugh 30, Robin 29, Rachel 24, Jennifer 18, Simon 20, Stuart 17 and Scott 13. His son Ian, who has a fashion shop called Suters in Marlow with his wife Christine, said "My father never had a a hard word for anybody. 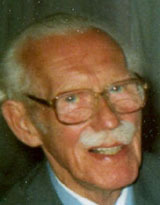 He was a marvellous person and father and never showed any favouritism to anyone". "Although he was not a churchgoer, he was quite a religious person"
The funeral service will be held at Slough Crematorium on Monday at 2pm, with family flowers only. 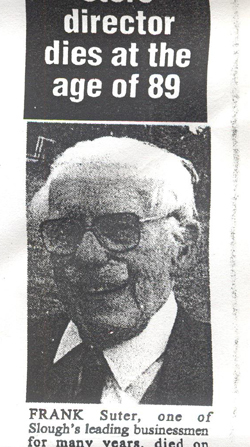 Frank Cyril Suter was born in July 1901 in Ledbury. A photograph of the family taken in the garden of Bank House, Ledbury in 1903, has Elizabeth and George William (Clarence's parents) standing at the back with Clarence (in front of his mother), Winifred, Frank (on the rocking horse) and Arthur (aged 8). By the summer of 1914 Frank then aged 12 and younger brother John, aged 6, were at the Grammar School formerly the Russell Endowed School and within a year Frank Suter was talking about engineering as a profession. 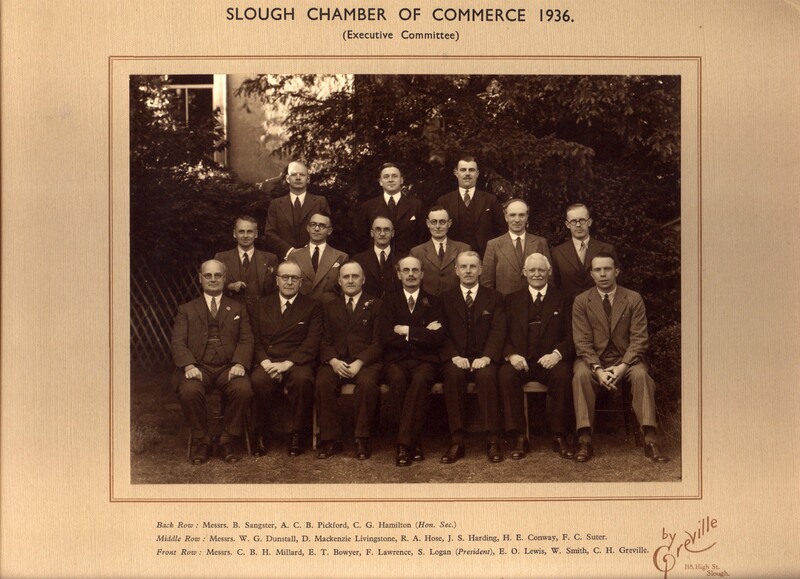 Towards the end of the 1937 Frank Suter was elected as the next President of the Slough Chamber of Commerce and the speeches delivered at the annual dinner and dance at The Old Crown Hotel, Slough on Wednesday 17th November 1937. 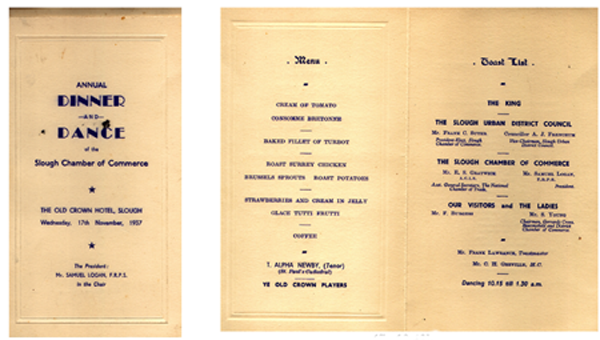 Frank's scrap book, (now in the possession of Tony Suter), contains reports of the dinner from two, unidentified, local papers - one probably The Slough Observer. The main issues were, first, the rates - would they be increased after the next revaluation; secondly, the danger of expensive 'improvement' schemes launched by a new council armed with a borough charter and itchy fingers and, thirdly, the destruction of trade in the High Street which would, undoubtedly, result from the new council parking restrictions. 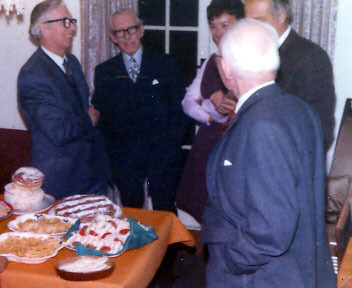 Mr Suter in proposing "the Slough Urban District Council", said that in all probability it was the last time the toast of the Council would be given in these terms. By this time next year the civic life of Slough may have taken a step further and Slough may have received its Charter of Incorporation. He was sure he was voicing the opinion of the majority of the people present when he said he hoped it would become an accomplished fact and he congratulated the Council on their efforts. It was a pious hope of theirs that it would not be a signal for extravagant schemes. Up the present, with few exceptions, they were proud of the way the affairs of the town were conducted, when the enormous growth of the town during the past few years was considered. They were thankful the rates were not higher but he reminded them that the valuation of shop property in Slough was too high. The coming revaluation would be a serious thing for traders of Slough and any addition would have serious repercussions throughout the town. With the monopolies backed by big finance the private trader's position became more difficult and he hoped they would keep the assessment at a fair economic basis. "Unilateral Parking" regulations restricted the parking of cars to one side of the street only. The earliest example of the use of the term given in the Oxford Dictionary is a Watch Committee report of Oxford City Council in 1945 but Slough was already trying them out eight years earlier. …….With regard to the incorporation they were hoping it would go through, and 1st December - the day for the inquiry to begin - was near at hand. Slough, as they knew, had grown very rapidly in the past five years. Growing children needed plenty of care and attention. Their rates were low……. There were many needs in the town and it was only by careful planning over a period of years that they were able to get over these difficulties. Unilateral parking was being tried out as an experiment but they did not want any traffic to pass out of the town. If the Council found it was a failure they would then turn their attention to a car park, which, in his opinion was urgently needed. For some time the Chamber had complained about the lighting of the High Street. At the east and west of the town they had a new type of lighting. Who could tell when east and west would meet? 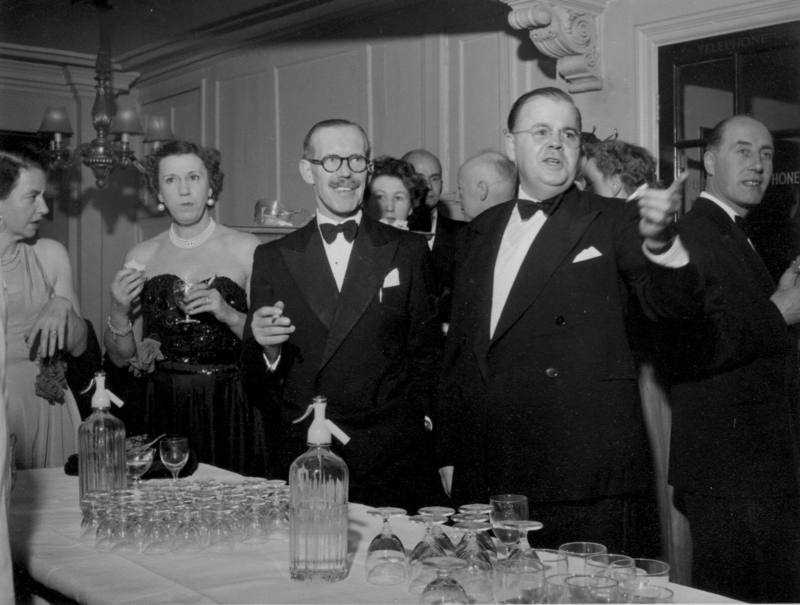 There were many things with which the Chamber of Commerce and the Council were on common ground, though sometimes they were against one another. …….While slum clearance did not affect Slough new development did and he was sure that some had benefited from the development at the Upton Lea Estate. Town planning was a very serious thing and should be a great help to shop-keepers because as they were aware it limited the number of shops and the shopping area. It was a pity Slough was not town-planned some time ago but they hoped a map would soon be deposited so that the whole of the traders would have some idea of how the town would be planned with regard to houses, factory sites and shops etc. It is not recorded that the suggestion of a shoppers car park sparked much response from Councillor Frenchum's audience. A car park was only to be considered if unilateral parking failed and, in any case, why should shoppers wish to park in a separate car park when what they really wanted was to stop their cars in the street next to the shops. No one could expect the idea to catch on, could they? 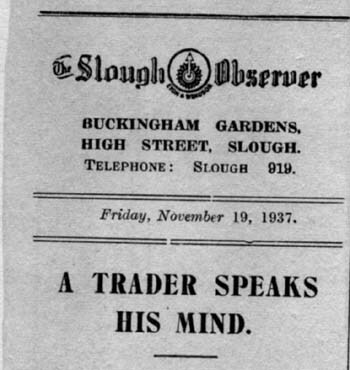 Frank Suter's speech won approval from the Editor of The Slough Observer on Friday, November 19th under the headline "A Trader Speaks His Mind"
Frank Suter was one of the men called up as part of the "intake" needed to reorganise the Army and increase the numbers of armoured troops. His brother, John, received his call up papers for the RAF and could expect to be employed on the ground in air defence. Both Frank and John had plenty of warning before 'call-up'. First, came registration, and later a medical when someone as optimistic as John would have confirmed that he had never felt fitter! There was, then, a pause for a few weeks and finally a letter instructing the happy recipient to report on a certain date and time for basic training. The letter was accompanied by a travel warrant and instructions describing the very limited range of things he should bring. Each in his turn said good bye to wife and family and departed for the train station carrying a very small suitcase. Frank received his call up papers in late 1941 or early 1942. He had trained as a motor engineer before joining the family firm and it was this skill which dictated the kind of he would fulfil. As noted in Churchill's 'Directive' of October 1941 the need to form additional armoured formations was a priority. Frank was, also, an enthusiastic car driver which enabled him, eventually, to obtain a job driving a staff car. Frank never talked to his family about his war service. He was conscripted, removed from his family and business, did his duty and in the fullness of time was discharged. Military service was not a 'mind expanding experience' so far as he was concerned. He was glad when it was over and retained very little in the way of memorabilia. There are no letters or photos and the only papers surviving are newspapers and booklets bought by Frank while in Italy and kept by him after the war. We do not know the names of the unit or formation in which Frank served. His service number was '2391844'. 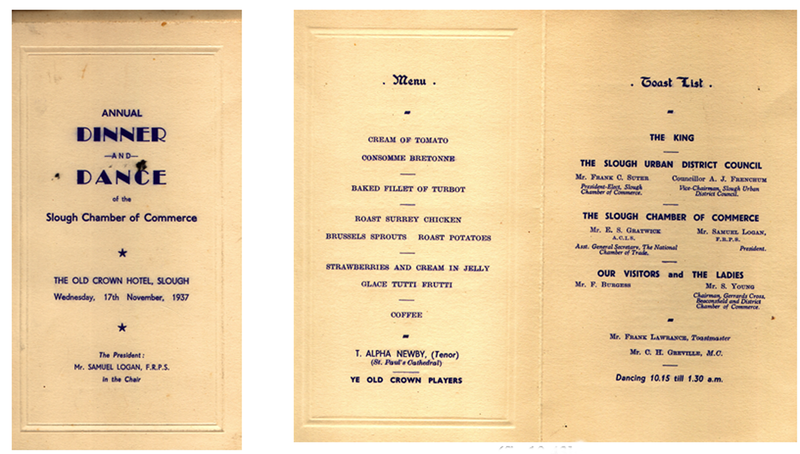 Tom Suter reports that he has a Suters Ltd staff dance menu card on which those attending noted their Corps or unit. In Frank's case the note reads "RCS" which suggests he was in the Royal Corps of Signals. However, he also understood that Frank drove a Tank Transporter which would indicate that he was in the Royal Army Service Corps. 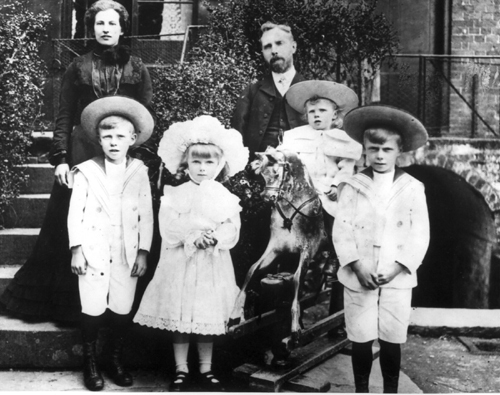 Frank's family were under the impression he was in "the Tank Corps". Tony Suter is obtaining a copy of Frank's service record but this is unlikely to be available for several months. We do know that Frank decided not to press for a commission as he felt that the physical demands of officer training would be too much for him at the age of forty. It is, not currently possible to trace Frank's progress through Tunisia and Italy. 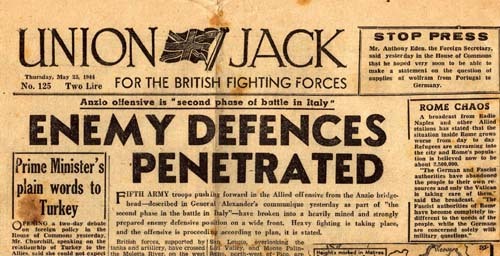 On the 25th May 1944, Frank Suter paid Two lire for a copy of 'Union Jack' the four page news sheet produced in Italy "for the British Fighting Forces". 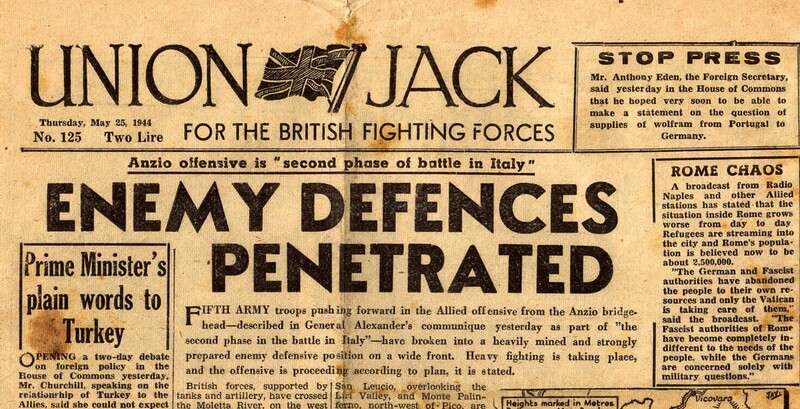 The leading news item was headlined "Enemy Defences Penetrated". There are the Japanese - American Japanese troops fighting with great vigour. The Greeks are coming, some are already there, and the force is already beginning to take its place in the field. There are the South Africans, and there are the French, and there are the Poles, who have greatly distinguished themselves. (Cheers) And, of course, playing a most important part, are the gallant Indians. There are also the powerful Canadians. Frank was still in the north of Italy on the 25th November 1945 when he bought a copy of Union Jack. By then the war with Japan was also over and the news was of the Nuremberg War Trials, the resignation of the Italian government and a dock strike in Britain. He was looking forward to his discharge which came, after seven more months in the Summer of 1946. Frank Suter was a very keen golfer and was a member of the Stoke Poges Golf Club and his home in Stoke Poges backed onto the course.